Lippold Park has Something for Everyone! Other amenities include restroom facilities, a playground, fishing piers, and a picnic shelter. Soccer and ball field rental is available by reservation only. This past year alone over 30,000 athletes, residents, and spectators visited Lippold Park. Many Park District affiliate groups, as well as other community groups call Lippold Park home including, Crystal Lake Little League, Babe Ruth Baseball, MCYSA World Series, The Soccer Federation, CL Raiders Football, and most recently, the Crystal Lake Youth Lacrosse League. A picnic shelter located at the Skate Park is available for rent. Lippold Park is also home to the Lippold Family Golf Center which includes two 18-hole miniature golf courses, a driving range, putting green, pro shop and on-site lessons. Stop by and try out the skate park for FREE at anytime while Lippold Park is open. 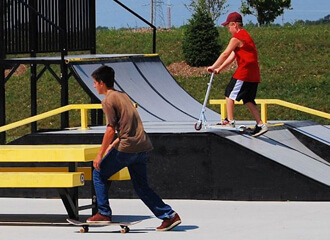 The skate park features a half pipe, quarter pipe, 4' bank, skate table, grind bench, two step pad, kinked rail, flat grind rail and round grind rail. Skates can also test their skills on a large pyramid consisting of a pyramid island, banked ramps, pyramid rails and pyramid stairs. The skate park is located on a 75' x 120' concrete pad. There is a small picnic shelter adjacent to the skate pad area available for rentals. 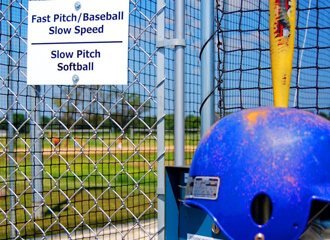 The batting cage system features four token-operated dual function cages with fastpitch baseball and slow pitch softball in every tunnel. Tokens can be purchased at the batting cages for $1 for 10 balls. Call 815.459.0680 ext. 333 for general batting cage information. During regular office hours, contact Kurt Reckamp at 815.459.0680 ext.1216 for batting cage group reservations and information. The outdoor fitness area features eight pieces of exercise equipment designed for outdoor use and for all ages and abilities. You can improve your strength, cardiovascular, flexibility, balance and coordination by working out in the outdoor fitness area. The area is located among native wetlands. Restrooms, drinking fountains, a rain shelter, playground, parking, the disc golf course and the Boncosky Softball Complex are nearby. The area is unsupervised and free to use. Safety guidelines are posted-use equipment at your own risk. Hound Town is a three-acre park located in the heart of the Lippold Park Sport Complex. It is a place where dogs can socialize and run off leash-dogs love it! The park is entirely fenced and is open year-round, dawn to dusk. Disc Golf (often referred to as frisbee golf) is a flying disc game, as well as a precision and accuracy sport, in which individual players throw a flying disc at a target. The object of the game is to traverse a course from beginning to end in the fewest number of throws of the disc.